host yourself a history fair! 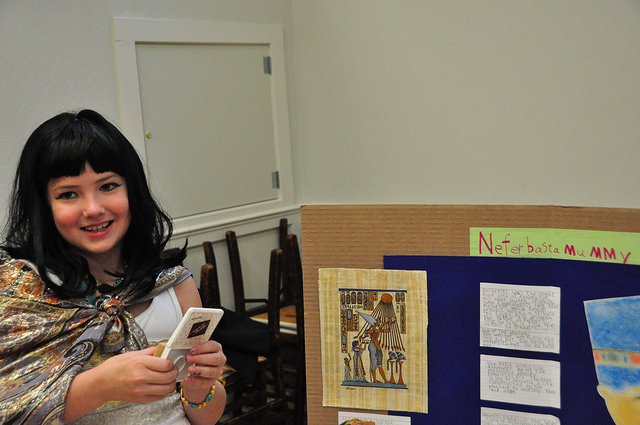 I know I’ve written a few times about the history fair our homeschool group hosts each spring. (Last year I wrote about Lulu’s One Hundred Years Of Food project.) This year I thought I’d describe in more detail how we structure the event, in case any of you might like to try something similar with your own friends. And you should. Because it’s a whole lot of fun. We call our event the Trip through Time. 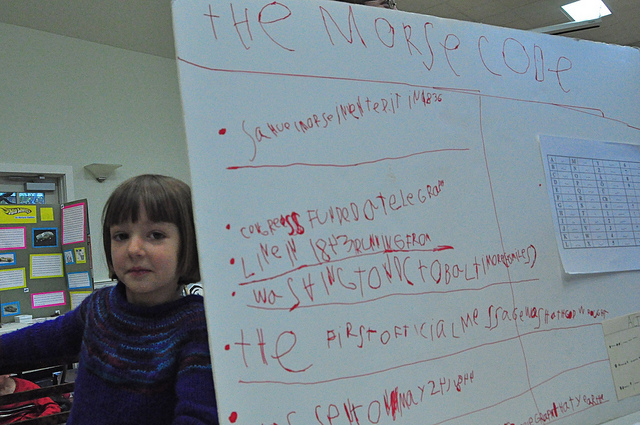 Basically, kids choose their own historical topics of interest. Anything goes, from feudalism to the Great Depression; from the history of Broadway musicals to the history of Hot Wheels. 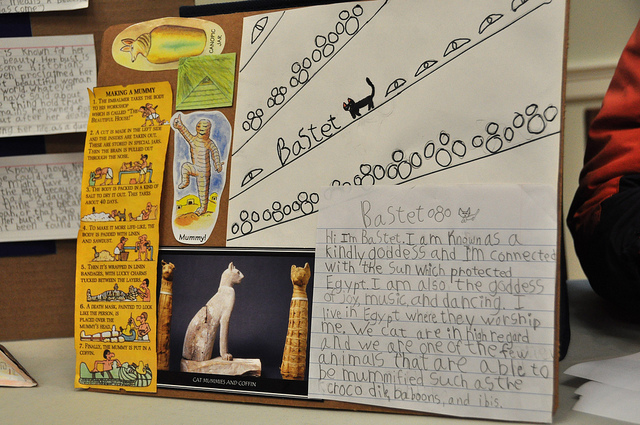 Kids prepare displays on their chosen topics. 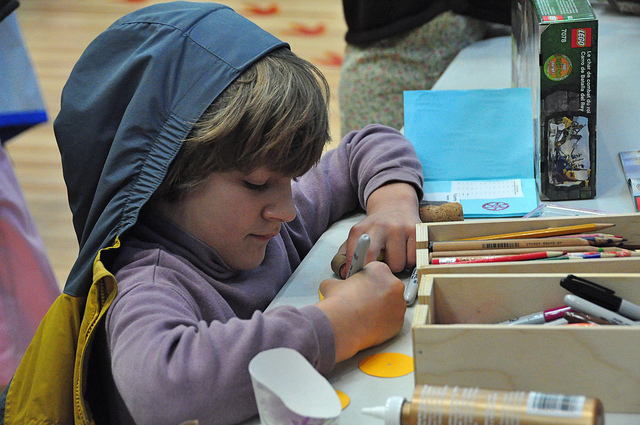 We encourage kids to come up with not only a visual display, but also a way for visitors to interact. They might give visitors a chance to dig for dinosaurs. Or take tea in the manner of Jane Austen. 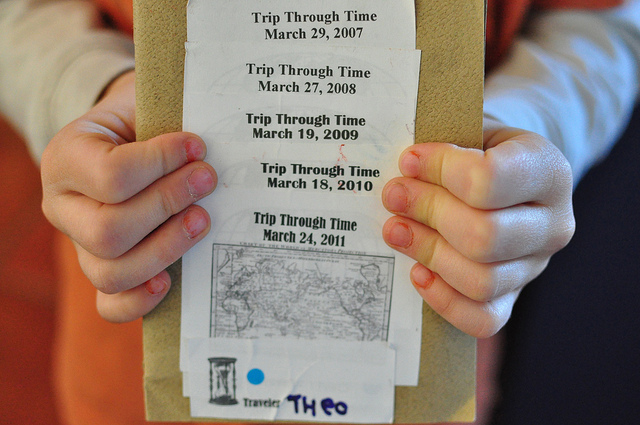 After kids visit an exhibit, that exhibitor stamps (or stickers) the visitor’s passport. 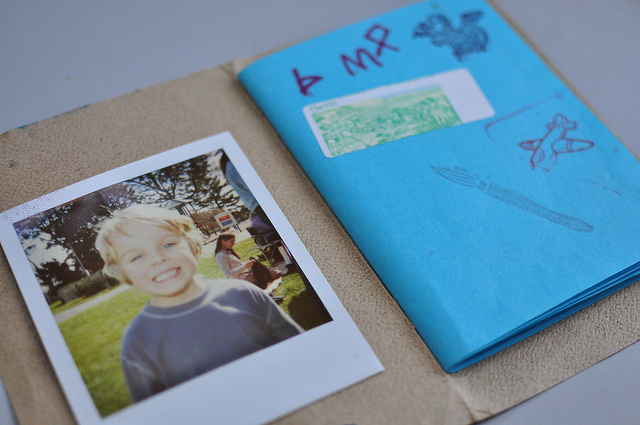 Some kids use the same passport year after year, which makes them seem particularly well traveled. We divide kids into three groups ahead of time, and designate those groups with a color dot placed on their passports. Then we take turns visiting exhibits. 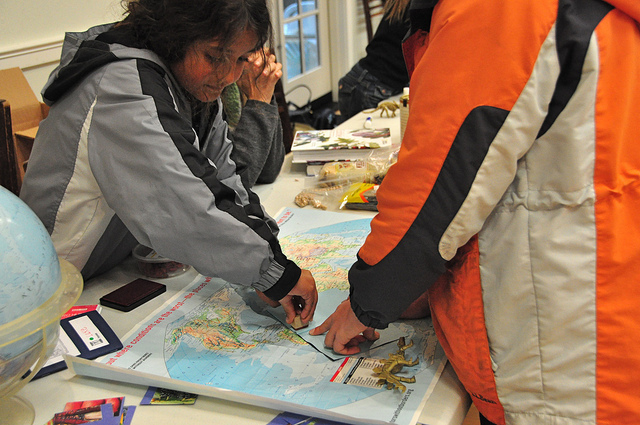 The first group gets 20-30 minutes to visit exhibits; the other two groups stay at their displays and receive visitors. Then the next group gets to visit, and the other two groups speak with visitors. And so on. This set-up encourages interaction. In the early days, we tried a more free-form history fair, in which the displays were set up, and everyone visited them all at once. This meant that everyone was visiting, and no one stayed at his or her own exhibit and discussed it. And the kids were finished looking after about ten minutes and ready to move on. With the rotating set-up, presenting one’s topic becomes an integral part of the event. My favorite part of the day is chatting with kids who are fired-up about something they’ve learned about! We also leave time for performances related to the exhibits. 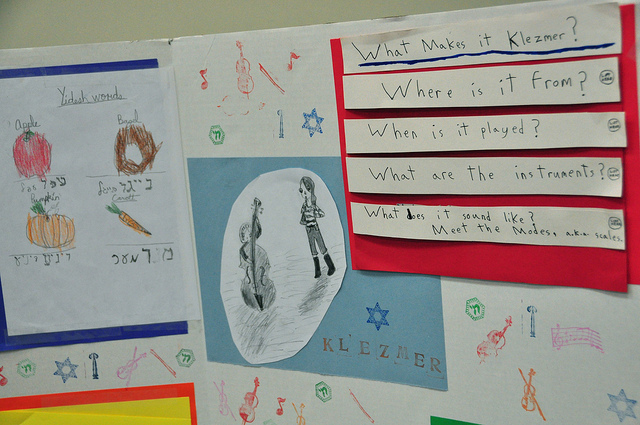 This year we were treated to a performance of Klezmer music. 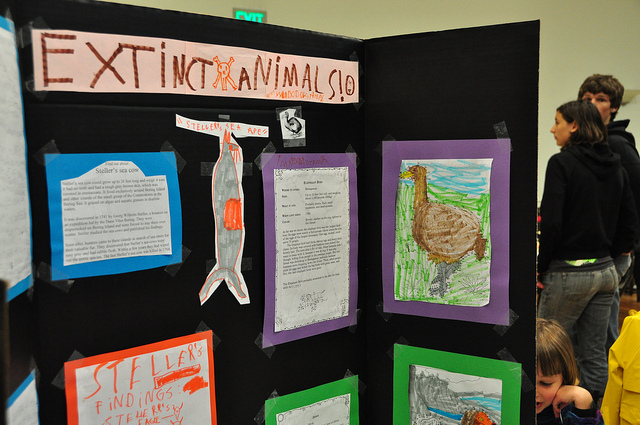 I especially love how this sort of a fair provides an audience for a homeschooler’s work. Over the years, all three of my kids have passionately dug into topics, and spent much more time than usual creating interesting ways of displaying those topics, knowing people beyond their own family would see them. (Remember H’s model of the Duomo? Or Lulu’s Indian kitchen?) The fair has always been a tangible motivation. 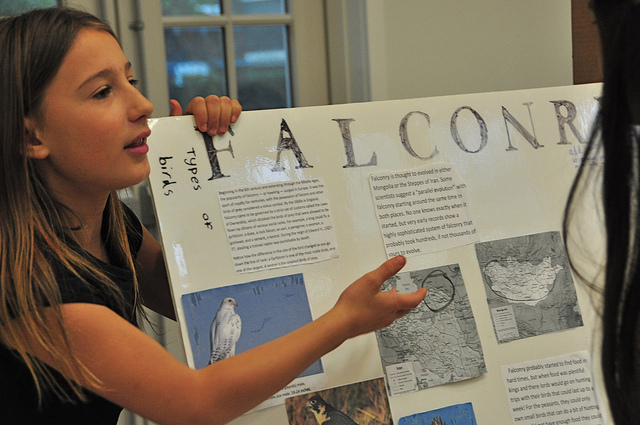 One year our group hosted a science and math fair, but really, there are infinite possibilities: how about a literature fair, or an art fair, or an invention fair? Just pick a date, find a space, and send out an invite. The kids’ enthusiasm will take over from there. 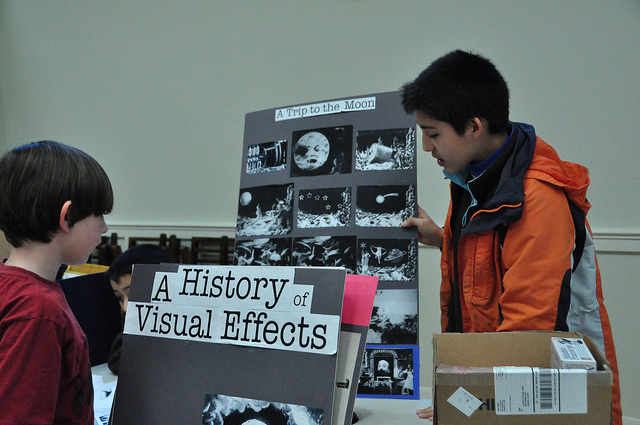 Edited to add: Check out my kid’s 10-year retrospective of his history fair projects in A History of History Fairs. I love this post of the fair. I was sorry to miss it. I think in looking back on 18 years of homeschooling my son, Vincent, I loved most these types of events. We could share with all our community in such a rich and personal way what we were all up to in our homes. Thanks Tricia for posting this. Jenny. Hi Jenny! So nice to hear from you! I love this line: “We could share with all our community in such a rich and personal way what we were all up to in our homes.” Exactly! It gives us a chance to step into each family’s life just a little. I’m bummed we missed this, due to being out of town. Can’t wait until next year! It looks like so much fun. 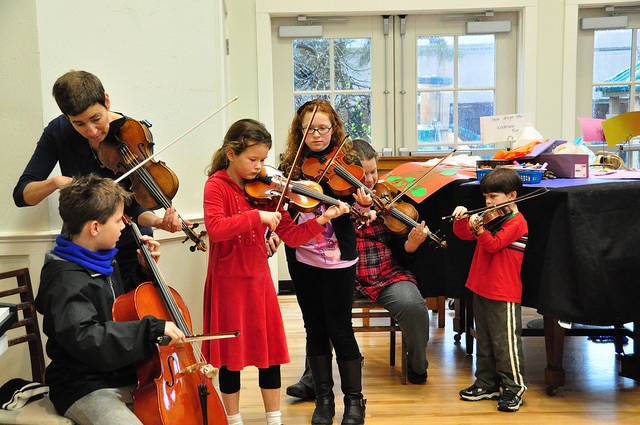 The enthusiastic, absorbed expressions on the kids’ faces show it all. Congratulations! where’s the like button? i’m inspired – almost to action! Inspired to make me that (real) like button, or to host a history fair? I think you should host a fair. I would love to see how your creative mind tweaks it! 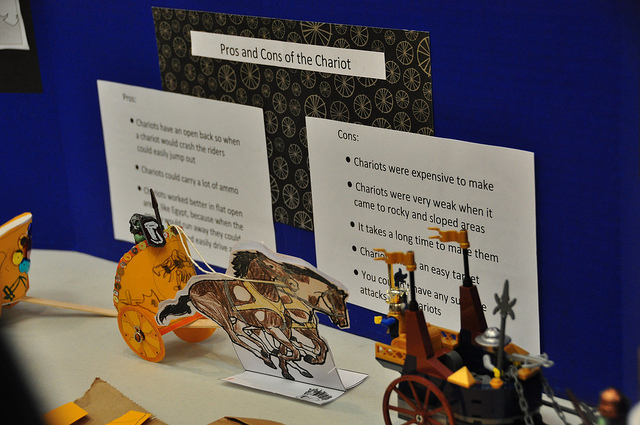 I especially loved the idea behind the Pros&Cons of Chariots project and, of course, Hephaestus!!! And it’s something all kids – homeschoolers or not – can do, even if not in the school setting… as you say, just gather some friends, find a place and a date and there you have it. I’ll try this at home during Easter break and tell you how it goes! Sure, Marta, any group of families could do something like this. Please let me know if you do; I’d love to hear about it! It all looks so wonderful, my youngest would thrive in a group like yours … but sadly, we have yet to find one here where we are. I’ve been part of our group for about twelve years! But when we joined, the group had only been around for about six months. It was started by a little handful of moms, and it grew from there. If you can’t find a group you like, maybe you can start one of your own. I don’t know how we’d homeschool without our group! 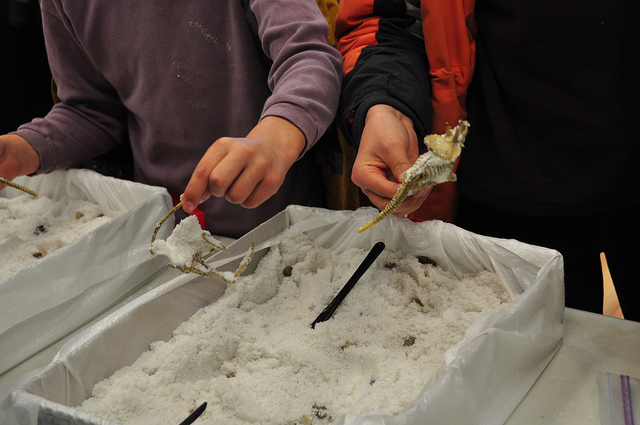 You mentioned ways you encourage kids to make their exhibits interactive. I’d be interested to see if you have any handouts you give the kids to help them plan their displays. This looks fun–I’m already thinking this might be just the thing to lift us Twin Citians out of our late-winter funk next March! I’m so glad you’re thinking of hosting a history fair! I’ll email you a copy of the invite I send to families, which describes the fair, and gives examples of interactive possibilities. Ooooh, can I have a copy, too, please? Oh, may i have a copy as well? What a fantastic fair. The one thing I love about history is it’s diversity and the inspiration it creates. Such a wonderful occasion for all of you to get together and share. I agree with you about history, Valarie. I always feel a little sorry for people who say they don’t like history! Somehow your comment got stuck in my spam folder, Danna, and I just discovered it. Thanks so much for stopping by! It’s been a while. My house move is done and we’re kind of settled. Looking at the exhibits from this history fair has left me full of excitement and amazed at the possibilities! Wow, what wonderful work the kids have done. This idea is fabulous, Patricia. Though I don’t home school my daughter, I do spend good deal of time doing all sorts of activities with her, related to different subjects. And, we could do this sort of fair with her friends and class mates. Thank you for sharing this post complete with all the photos. PS: O, and also saw your daughter’s project on Indian Kitchen and chana masala. My God – that was some craftsmanship! Really adorable. Thanks, Rashmie! Yes, such a fair could be fun for any group of friends. If you organize one, please let me know! Oh, I would so love to “steal” this idea for our home school group. Could you send me a copy of the parent letter, as well? Steal away, Sarah! And I’ll be happy to send the letter along. I really appreciate your help. I’m so excited to do this with our group. You’re too kind. This is FABULOUS! I would love to get a copy of the parent letter that you send out. I think we’re going to end our co-op year by hosting a project fair. Thanks for all of the info you posted here! Thanks, Shannon! I’ll forward that email. If your group does do a history fair, I hope you’ll let me know! I love this idea! I’m thinking it would be a great way to finish up the school year 😉 I was wondering if I could get a copy of the parent letter as well. Thanks so much! Thanks for your interest! I’ll forward the parent letter via email. I hate to sound like a broken record, but you could also send me a copy of the parent letter? I’ve emailed our group leader about this, but she has a lot on her plate and may suggest I be in charge (and as leadership is not a gift God gave me), I could use all the help I can find! I’m also thinking an art fair might be a great way to end the year: every kids picks 1 favorite art project they completed and its displayed at our end of the year party. Thanks for the inspiration & for sharing how you did it! Sorry for the delayed response, Andrea, but the holidays hit and I’m just catching up. Sometimes if we want our kids to have opportunities like this, the only way we can do so is by stepping up to the plate ourselves. Good for you for considering it–and an art fair sounds like fun! You might want to think about having artists take turns sitting by their art, and receiving visitors, as I described above. 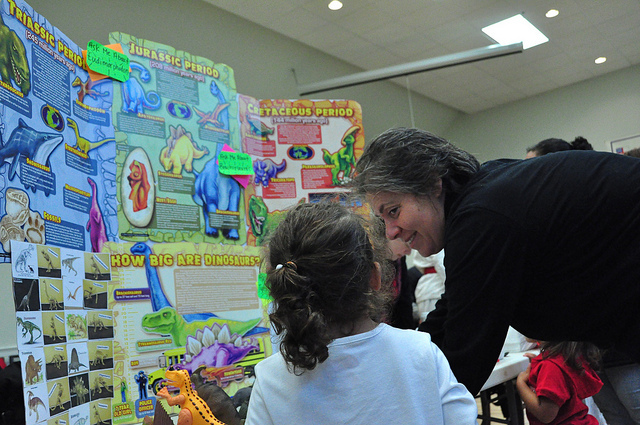 What really makes the history fair fun is the interaction between presenters and visitors. Will send that parent letter your way. Happy new year! Thank you! (And no worries about the delayed response; I didn’t notice!) And you are right about stepping up to the plate if I want my kids to do something like this. I’ve been thinking that very same thing (and revisiting your post again and again to let it all percolate in my subconscious). I do have another question for you: what kind of facility did you use for the history fair? Our group often does things at our library (which doesn’t have a ton of space) or outside at a local park. Thanks again for your help! Oops, nevermind! I saw your venue on the letter! Which immediately gave me a great idea of where to host it should our library hall prove to be too small! Thanks again! Glad you figured something out, Andrea! Hi! A friend linked to your post on rhythm of the home. I am so glad she did! Brought my husband + I to tears ~ beautiful + so heartfelt, thank you. I’m enjoying looking thru your posts. Very much looking forward to the writing ones, as we have a small reading + writing group for homeschooled kids. We’re always looking for ideas + continually amazed how the kids always take things to places we had not imagined! I was also hoping to get a copy of the letter to the parent for the history fair. Will do, Amanda. Thanks so much for reading! I love, love your blog. I’ve bookmarked it so I can come back when I have more time to read all of it. This particular post was so interesting as I have hosted a history fair for four years now and it is a very popular event in our community. I was trying to think of a better way to keep kids interested for the entire duration of the fair, and I am so grateful that you have shared your successes online. I am using your idea of the ‘rotating setup’ for this year’s fair, our 5th! Previously we had a general “milling about” time for the first hour, and then would use the rest of the time to go around the room so the participants could present their projects, one by one. Now that we have close to 50 children showing up, I need to change this setup! How fantastic that you have close to 50 kids attending your history fair, Ingrid! I hope other Wonder Farm readers see that! 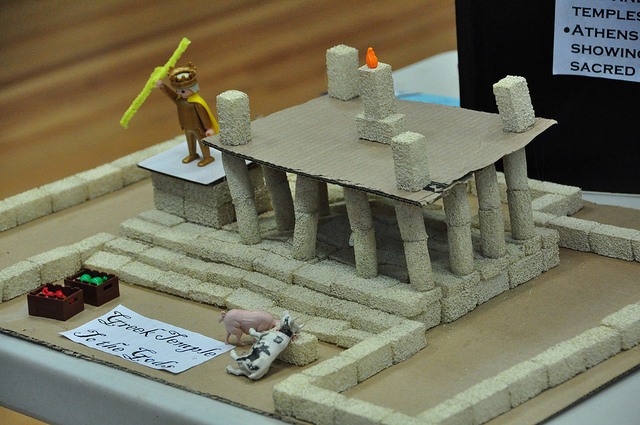 I’d love to see history fairs crop up all around! I gave a basic explanation of how we structure our rotation in the post; if you have any other questions, send me an email via the “contact me” link in the sidebar, and I’ll try to help out. One tip: if you put the kids in three groups as we do, put the youngest and most energetic kids in the middle group of visitors. That way they won’t be at their display for two sessions in a row. It breaks things up better for them. Older and more patient kids are good for the last group of visitors. Good luck with your 5th fair, Ingrid! I wanted to tell you that our 5th annual history fair here in Ottawa, Canada was a resounding success! I followed your advice for the “rotating” setup and it worked wonderfully – everyone was happy. Next year I am going to get my hands on a portable microphone and speaker so that the quieter ones can present and be heard. Thanks again! Thanks so much for taking the time to tell me how your fair went, Ingrid! I’m so glad that the rotating set-up worked well for your group. Our annual fair is *tomorrow*, and I can’t wait! I’m so excited to walk around and talk to kids about their interests. It’s an annual highlight for me. 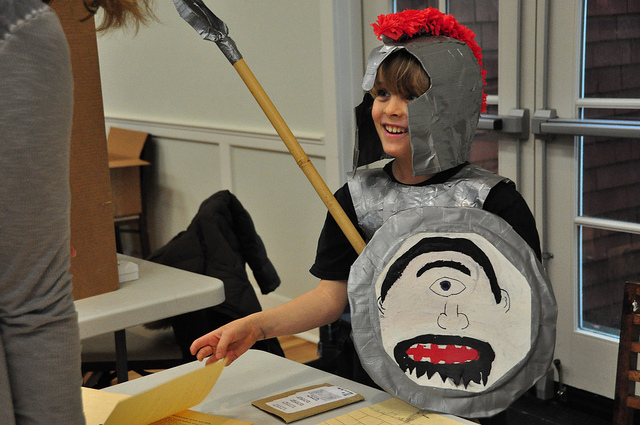 I came across the description of your homeschool history fair a few months ago and thought it was a fabulous idea! Now, I’m in the process of organizing one for my children. Thank you for all your tips to making the event more enjoyable for both visitors and participants. I can’t wait to incorporate them in the fair. It sounds like the fair lasted for 1 hr. for the displays + performances (how much time? Did you put a time limit per performance?) + setup (time?) + tear down (time?). Can you please give me the approximate time required for each segment of the fair? I may need to rent space and I need to know how much time to book. Can you please email the parent letter you sent and any other material you may think would be useful? So glad that you’re organizing a fair, Mellany! If there are a lot of exhibits, we sometimes give kids the option of going back to any exhibits they may have missed during the last ten minutes or so. Then we ask everyone to help clean up–sweeping, putting tables away, etc. That goes pretty quickly with lots of help. If you have to pay for the space by the hour, you could probably rent for less than three hours–but everything seems to take a little longer than you might anticipate. Best of luck with your fair! I would love to receive an email copy of your invitation letter, too. My oldest is but 7 1/2, but has begun to love history. I would love to begin an event like this in my area. Thank you. Sorry not to have replied sooner, Martianne; I’ve been traveling. Will do! I love this idea for my third graders and can see adapting it to meet our Illinois past and present standards for social studies. Like so many others, I would love a copy of your parent letter. Thanks so much and enjoy your summer! Thanks for saying hello, Leanne, and good luck adapting this idea with your third graders! I’ll send that letter via email. 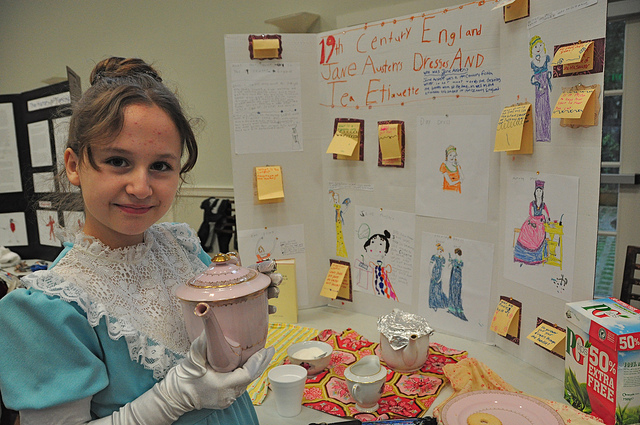 My 12-year-old soon love history and came up with the idea of a history fair. I have never heard of one but it turns out they are fairly popular! Your offer is the best I’ve seen describing how to do it in a way that is treasonable and fun. Would you please email me your patent letter? I have never organized an event like this and could use all the help I can get! Thanks!!! Hi Carla! I’m so sorry not to have responded sooner! I missed your comment somehow. Yes, I will send along the letter. So right! Thanks for the letter, it is a great start! I’m a few years behind everyone else but a history fair sounds wonderful! I’ve been trying to come up with a way to encourage our homeschoolers-in-hiding to come out and play – this might just be the ticket! Could I get a copy of the letter as a starting point? Thank you!!! Hi Angela! It’s never too late for a history fair! 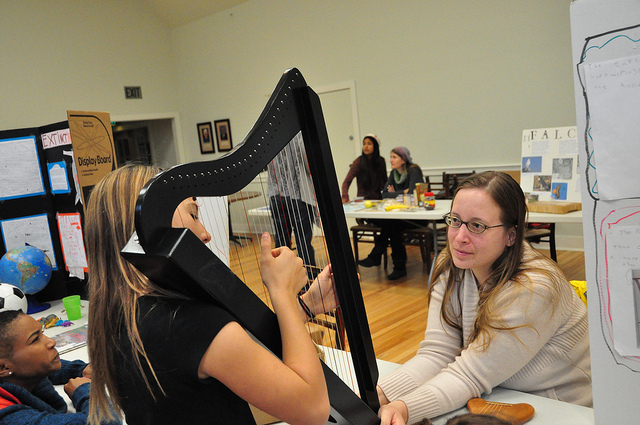 And, yes, I’ve always found that this event both brings out the regulars and also other homeschoolers whom we haven’t met before. Sometimes being part of the fair was just what it took to get them to come around more often! I hope you do it! I’m sending my info message to you via email right now. You might need to check your spam folder. Good luck! This is my first year homeschooling. I have two girls that are middle school age. We have joined a couple of homeschool groups in our area. I would like to participate and maybe co-host a history fair with another mom. Would you be so kind to send me that parent letter or any pertinent information. Any help would be most appreciated. Thank you so much in advance. I’m so sorry for not responding sooner! I was out of town for a few days. Co-hosting a fair with another mom is a great idea! I had co-hosts the first few years, and it does make everything easier. I will send the parent letter to you via email. I hope you host a fair, Laura! It’s so great to see what the kids come up with, and to chat with them about their projects. It was always a homeschooling highlight for me. And also: welcome to homeschooling! Good for you for joining groups, and for considering planning events. Best of luck to you and your daughters!